New York has been a champion of combined heat and power (CHP) for many years. But now the technology — often found in microgrids — is getting a new boost under the state’s Reforming the Energy Vision (REV). REV heightens opportunity for CHP by disrupting the centralized utility model and creating a kind of market exchange for distributed energy. Policymakers are still hashing out the details on how REV will work. But meanwhile, Gov. Andrew Cuomo’s administration has been taking a series steps to keep distributed energy moving forward. To that end, New York is in the process of boosting the number of CHP projects in the state by 10 percent with the new funding, according to information released by Cuomo’s office this week. The New York State Energy and Research Development Authority is providing $41 million for 53 CHP projects. Private investors are providing the remaining $217 million. CHP already is used in more than 500 buildings in New York, about 12 percent of the 4,100 buildings nationwide where the technology can be found. Columbia University is installing the largest of the NYSERDA-backed projects, a 15-MW CHP facility. The college received $2.4 million from the state with remaining funds for the $37 million project from private sources. Since Superstorm Sandy, CHP has won new support for its ability to keep the lights on during a grid outage, particularly when it is configured into a microgrid. Several of the 83 microgrids vying for separate NY Prize funding include CHP. But CHP is being adopted for other reasons as well. It increases energy efficiency by reusing excess heat and lessening electric grid line loss. As a result, CHP can lower energy costs. Albany Medical Center, which installed a 4.6-MW CHP unit two years ago, reported that it provides electricity at a cost 22 percent less than the electric grid. The campus is also saving additional money by receiving free steam from the unit, which provides about half the center’s power needs and one-third of its steam needs. Bates Troy, an industrial laundry service in Binghamton, installed a unit in May. The company provides linens to hospitals and other healthcare institutions throughout Central New York and the Southern Tier. Clarkson University’s Technology Advancement Center has LEED Gold certification because of its state-of-the-art heating and cooling, passive solar and rainwater collection systems, among other innovations. The building’s CHP unit, along with an absorption chiller, can produce power, heating and cooling year round. When the 53 pending projects are running, state-sponsored CHP will total about 200 MW, the energy needed to power more than 32,000 homes. The projects are now underway or set to begin. The projects, which are in hospitals, schools and other buildings, are listed here. The list includes project size, amount of public and private funding, and total cost. 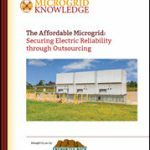 Follow the growing use of CHP in microgrids by subscribing to the free Microgrid Knowledge newsletter. Hospitals in the U.S. use an average of 27.5 kilowatt-hours (kWh) of electricity and 110 cubic feet of natural gas per square foot (ft2) annually. In a typical hospital, lighting, heating, and hot water represent about 72 percent of total energy use (Illustrated Above), making those systems the best targets for energy savings. To learn how CHP can reduce these operational cost while reducing carbon emission contact me.